As time progresses, life seems to get harder and harder for modern day immigrants – both legal and illegal. One of the biggest hardships faced by all immigrants are state bills like Alabama HB 56 and Arizona SB 1070 that allow law enforcers to question anyone suspicious about their citizenship. Immigration bills with this kind of general character are found in many states today and often disrupt the lives of law-abiding immigrants. However, for every person who favors strict, generalized immigration laws, there's usually a person who sides with immigrants and shows empathy. These empathetic people understand that the foundation of the United States was built by immigrants and view the 14th Ammendment as, not a grounds for immigration restriction, but as a grounds for making the country richer and more diversified with the world's people. To show our empahty and respect for today's immigrants in a creative way, our lawyers who practice immigrationi law in Dallas, TX have compiled a list of political cartoons illustrating the nonsensical immigration bills passed. This references the Alabama HB 56 immigration law that caused illegal immigrants to withdraw from school. Mothers feared their children's attendance would cause unwanted attention from authorities and, therefore, took them out of class. 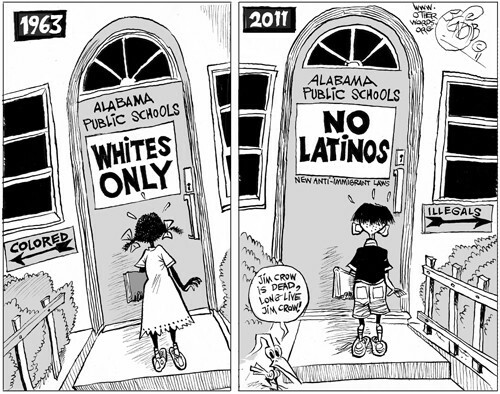 This cartoon illustrates that the schools may as well have put a No Immigrants sign on school doors that would drive innocent children away, much like African Americans were driven away by Whites Only signs in the 60's. 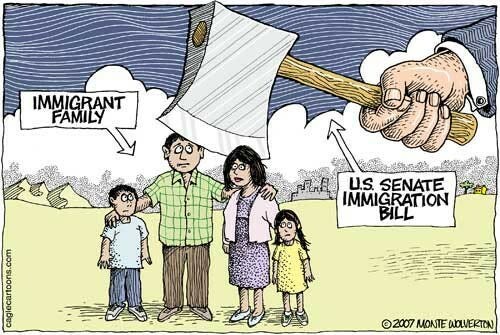 This political cartoon illustrates how strict immigration and deportation laws made by the U.S. Senate can chop families in two. For instance, if a legal U.S. citizen (man) marries an illegal immigrant (woman) and the couple has kids, the woman may be forced to leave. Her family, however, would be allowed to stay in the States because the kids were born in the U.S. and the husband was already a U.S. citizen. What happens, in some cases, is that the deported partner will insist her family stays in U.S., especially if her homeland isn't fit for raising a family. Partners who are illegal immigrants can apply to become a citizen, but acceptance is not guaranteed just because of wedlock. This is one many of our clients could have related to before visiting the McGregor Firm. Today, the immigration process is very complex and navigating it successfully means getting the help of an immigration lawyer. It's not as simple as arriving to the U.S., going through a check-up, and receiving verification papers like immigrants who arrived to Ellis Island did. The message here is: don't navigate the waters of immigration on your own. 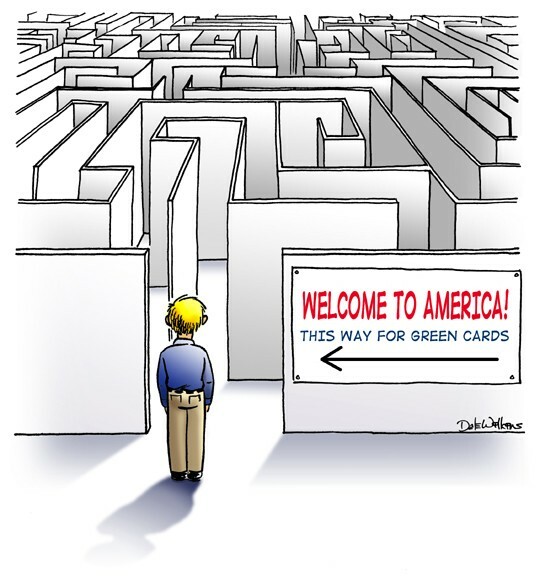 Get help from an immigration lawyer because going it alone can feel like walking through an unending maze.